Proprietary Name: Methylphenidate Hydrochloride What is the Proprietary Name? Non-Proprietary Name: Methylphenidate Hydrochloride What is the Non-Proprietary Name? 62037 - Actavis Pharma, Inc.
Methylphenidate Hydrochloride with NDC 62037-727 is a a human prescription drug product labeled by Actavis Pharma, Inc.. The generic name of Methylphenidate Hydrochloride is methylphenidate hydrochloride. The product's dosage form is tablet, film coated, extended release and is administered via oral form. Labeler Name: Actavis Pharma, Inc.
DEA Schedule: Schedule II (CII) Substances What is the Drug Enforcement Administration (DEA) CII Schedule? The controlled substances in the CII schedule have a high abuse potential with severe psychological or physical dependence liability, but have accepted medical use in the United States. Schedule CII controlled substances include certain narcotic, stimulant, and depressant drugs. FDA Application Number: ANDA076655 What is the FDA Application Number? Methylphenidate hydrochloride extended-release tablets should be given cautiously to patients with a history of drug dependence or alcoholism. Chronic abusive use can lead to marked tolerance and psychological dependence with varying degrees of abnormal behavior. Frank psychotic episodes can occur, especially with parenteral abuse. Careful supervision is required during withdrawal from abusive use since severe depression may occur. Withdrawal following chronic therapeutic use may unmask symptoms of the underlying disorder that may require follow-up. Methylphenidate hydrochloride extended-release tablets are indicated for the treatment of Attention Deficit Hyperactivity Disorder (ADHD) in children 6 years of age and older, adolescents, and adults up to the age of 65 [see Clinical Studies (14)]. A diagnosis of Attention Deficit Hyperactivity Disorder (ADHD; DSM-IV) implies the presence of hyperactive-impulsive or inattentive symptoms that caused impairment and were present before age 7 years. The symptoms must cause clinically significant impairment, e.g., in social, academic, or occupational functioning, and be present in two or more settings, e.g., school (or work) and at home. The symptoms must not be better accounted for by another mental disorder. For the Inattentive Type, at least six of the following symptoms must have persisted for at least 6 months: lack of attention to details/careless mistakes; lack of sustained attention; poor listener; failure to follow through on tasks; poor organization; avoids tasks requiring sustained mental effort; loses things; easily distracted; forgetful. For the Hyperactive-Impulsive Type, at least six of the following symptoms must have persisted for at least 6 months: fidgeting/squirming; leaving seat; inappropriate running/climbing; difficulty with quiet activities; “on the go;” excessive talking; blurting answers; can't wait turn; intrusive. The Combined Type requires both inattentive and hyperactive-impulsive criteria to be met. Methylphenidate hydrochloride extended-release tablets are indicated as an integral part of a total treatment program for ADHD that may include other measures (psychological, educational, social). Drug treatment may not be indicated for all patients with ADHD. Stimulants are not intended for use in patients who exhibit symptoms secondary to environmental factors and/or other primary psychiatric disorders, including psychosis. Appropriate educational placement is essential and psychosocial intervention is often helpful. When remedial measures alone are insufficient, the decision to prescribe stimulant medication will depend upon the physician's assessment of the chronicity and severity of the patient’s symptoms. Methylphenidate hydrochloride extended-release tablets should be administered orally once daily in the morning with or without food.Methylphenidate hydrochloride extended-release tablets must be swallowed whole with the aid of liquids, and must not be chewed, divided, or crushed [see Patient Counseling Information (17)]. The recommended dose of methylphenidate hydrochloride extended-release tablets for patients who are currently taking methylphenidate twice daily or three times daily at doses of 10 mg/day to 60 mg/day is provided in Table 2. Dosing recommendations are based on current dose regimen and clinical judgment. Conversion dosage should not exceed 72 mg daily. Table 2. Recommended Dose Conversion from Methylphenidate Regimens to Methylphenidate Hydrochloride Extended-Release Tablets Previous Methylphenidate Daily DoseRecommended Methylphenidate Hydrochloride Extended-Release Tablets Starting Dose 5 mg Methylphenidate twice daily or three times daily 18 mg every morning 10 mg Methylphenidate twice daily or three times daily 36 mg every morning 15 mg Methylphenidate twice daily or three times daily 54 mg every morning 20 mg Methylphenidate twice daily or three times daily 72 mg every morning Other methylphenidate regimens: Clinical judgment should be used when selecting the starting dose. Doses may be increased in 18 mg increments at weekly intervals for patients who have not achieved an optimal response at a lower dose. Daily dosages above 54 mg in children and 72 mg in adolescents have not been studied and are not recommended. Daily dosages above 72 mg in adults are not recommended.A 27 mg dosage strength is available for physicians who wish to prescribe between the 18 mg and 36 mg dosages. There is no body of evidence available from controlled trials to indicate how long the patient with ADHD should be treated with methylphenidate hydrochloride extended-release. It is generally agreed, however, that pharmacological treatment of ADHD may be needed for extended periods.The effectiveness of methylphenidate hydrochloride extended-release for long-term use, i.e., for more than 7 weeks, has not been systematically evaluated in controlled trials. The physician who elects to use methylphenidate hydrochloride extended-release for extended periods in patients with ADHD should periodically re-evaluate the long-term usefulness of the drug for the individual patient with trials off medication to assess the patient’s functioning without pharmacotherapy. Improvement may be sustained when the drug is either temporarily or permanently discontinued. If paradoxical aggravation of symptoms or other adverse events occur, the dosage should be reduced, or, if necessary, the drug should be discontinued. If improvement is not observed after appropriate dosage adjustment over a one-month period, the drug should be discontinued. Methylphenidate hydrochloride extended-release tablets, USP are available in the following dosage strengths: 18 mg – Each yellow, film-coated, capsule shaped tablet imprinted with the Andrx logo and 725 on one side and plain on the other side contains 18 mg methylphenidate hydrochloride, USP. 27 mg – Each gray, film-coated, capsule shaped tablet imprinted with the Andrx logo and 734 on one side and plain on the other side contains 27 mg methylphenidate hydrochloride, USP. 36 mg – Each white, film-coated, capsule shaped tablet imprinted with the Andrx logo and 726 on one side and plain on the other side contains 36 mg methylphenidate hydrochloride, USP. 54 mg – Each red brown, film-coated, capsule shaped tablet imprinted with the Andrx logo and 727 on one side and plain on the other side contains 54 mg methylphenidate hydrochloride, USP. Hypersensitivity reactions, such as angioedema and anaphylactic reactions, have been observed in patients treated with methylphenidate hydrochloride extended-release tablets. Therefore, methylphenidate hydrochloride extended-release tablets are contraindicated in patients known to be hypersensitive to methylphenidate or other components of the product [see Adverse Reactions (6.6)]. Methylphenidate hydrochloride extended-release tablets are contraindicated in patients with marked anxiety, tension, and agitation, since the drug may aggravate these symptoms. Methylphenidate hydrochloride extended-release tablets are contraindicated in patients with glaucoma. Methylphenidate hydrochloride extended-release tablets are contraindicated in patients with motor tics or with a family history or diagnosis of Tourette's syndrome [see Adverse Reactions (6.4)]. Methylphenidate hydrochloride extended-release tablets are contraindicated during treatment with monoamine oxidase (MAO) inhibitors, and also within a minimum of 14 days following discontinuation of a MAO inhibitor (hypertensive crises may result) [see Drug Interactions (7.1)]. Prolonged and painful erections, sometimes requiring surgical intervention, have been reported with methylphenidate products, including methylphenidate hydrochloride extended-release tablets, in both pediatric and adult patients [see Adverse Reactions (6.6)]. Priapism was not reported with drug initiation but developed after some time on the drug, often subsequent to an increase in dose. Priapism has also appeared during a period of drug withdrawal (drug holidays or during discontinuation). Patients who develop abnormally sustained or frequent and painful erections should seek immediate medical attention. Stimulants, including methylphenidate hydrochloride extended-release, used to treat ADHD are associated with peripheral vasculopathy, including Raynaud’s phenomenon. Signs and symptoms are usually intermittent and mild; however, very rare sequelae include digital ulceration and/or soft tissue breakdown. Effects of peripheral vasculopathy, including Raynaud’s phenomenon, were observed in postmarketing reports at different times and at therapeutic doses in all age groups throughout the course of treatment. Signs and symptoms generally improve after reduction in dose or discontinuation of drug. Careful observation for digital changes is necessary during treatment with ADHD stimulants. Further clinical evaluation (e.g., rheumatology referral) may be appropriate for certain patients. Careful follow-up of weight and height in children ages 7 to 10 years who were randomized to either methylphenidate or non-medication treatment groups over 14 months, as well as in naturalistic subgroups of newly methylphenidate-treated and non-medication-treated children over 36 months (to the ages of 10 to 13 years), suggests that consistently medicated children (i.e., treatment for 7 days per week throughout the year) have a temporary slowing in growth rate (on average, a total of about 2 cm less growth in height and 2.7 kg less growth in weight over 3 years), without evidence of growth rebound during this period of development. Published data are inadequate to determine whether chronic use of amphetamines may cause similar suppression of growth; however, it is anticipated that they likely have this effect as well. Therefore, growth should be monitored during treatment with stimulants, and patients who are not growing or gaining height or weight as expected may need to have their treatment interrupted. Since methylphenidate hydrochloride extended-release tablets may retain their shape or marginally deform in the GI tract, methylphenidate hydrochloride extended-release tablets should not ordinarily be administered to patients with pre-existing severe gastrointestinal narrowing (pathologic or iatrogenic, for example: esophageal motility disorders, small bowel inflammatory disease, “short gut” syndrome due to adhesions or decreased transit time, past history of peritonitis, cystic fibrosis, chronic intestinal pseudo-obstruction, or Meckel’s diverticulum). There have been rare reports of obstructive symptoms in patients with known strictures in association with the ingestion of drugs in nondeformable controlled-release formulations. 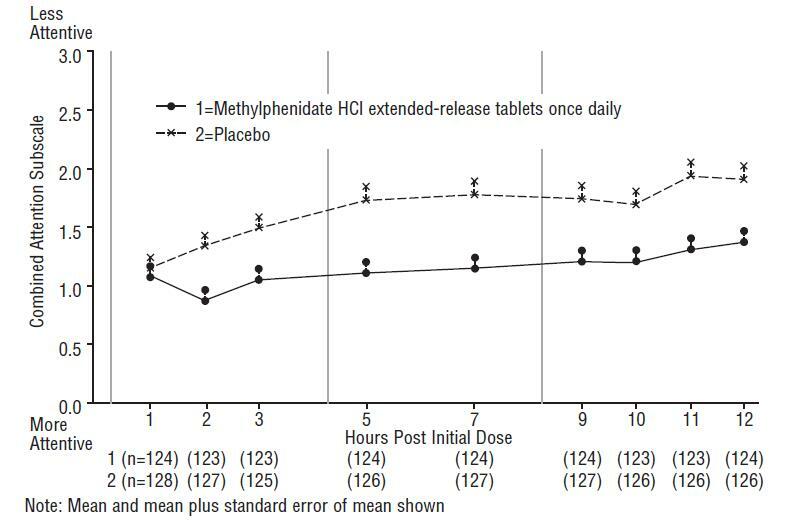 Due to the controlled-release design of the tablet, methylphenidate hydrochloride extended-release tablets should be used only in patients who are able to swallow the tablet whole [see Patient Counseling Information (17)]. Long-Term Suppression of Growth [see Warnings and Precautions (5.6)]Visual Disturbance [see Warnings and Precautions (5.7)]Potential for Gastrointestinal Obstruction [see Warnings and Precautions (5.8)]Hematologic Monitoring [see Warnings and Precautions (5.9)]The most common adverse reaction in double-blind clinical trials (greater than 5%) in pediatric patients (children and adolescents) was abdominal pain upper. The most common adverse reactions in double-blind clinical trials (greater than 5%) in adult patients were decreased appetite, headache, dry mouth, nausea, insomnia, anxiety, dizziness, weight decreased, irritability, and hyperhidrosis [see Adverse Reactions (6.1)]. The most common adverse reactions associated with discontinuation (greater than or equal to 1%) from either pediatric or adult clinical trials were anxiety, irritability, insomnia, and blood pressure increased [see Adverse Reactions (6.3)]. The development program for methylphenidate hydrochloride extended-release tablets included exposures in a total of 3906 participants in clinical trials. Children, adolescents, and adults with ADHD were evaluated in 6 controlled clinical studies and 11 open-label clinical studies (see Table 3). Safety was assessed by collecting adverse events, vital signs, weights, and ECGs, and by performing physical examinations and laboratory analyses. Table 3. Methylphenidate Hydrochloride Extended-Release Tablets Exposure in Double-Blind and Open-Label Clinical Studies Patient Population N Dose Range Children 2216 18 to 54 mg once daily Adolescents 502 18 to 72 mg once daily Adults 1188 18 to 108 mg once daily Adverse events during exposure were obtained primarily by general inquiry and recorded by clinical investigators using their own terminology. Consequently, to provide a meaningful estimate of the proportion of individuals experiencing adverse events, events were grouped in standardized categories using MedDRA terminology. The stated frequencies of adverse events represent the proportion of individuals who experienced, at least once, a treatment-emergent adverse event of the type listed. An event was considered treatment-emergent if it occurred for the first time or worsened while receiving therapy following baseline evaluation. Throughout this section, adverse reactions are reported. Adverse reactions are adverse events that were considered to be reasonably associated with the use of methylphenidate hydrochloride extended-release based on the comprehensive assessment of the available adverse event information. A causal association for methylphenidate hydrochloride extended-release often cannot be reliably established in individual cases. Further, because clinical trials are conducted under widely varying conditions, adverse reaction rates observed in the clinical trials of a drug cannot be directly compared to rates in clinical trials of another drug and may not reflect the rates observed in clinical practice.The majority of adverse reactions were mild to moderate in severity. Adverse reactions in the 4 placebo-controlled studies of children and adolescents leading to discontinuation occurred in 2 methylphenidate hydrochloride extended-release tablets patients (0.6%) including depressed mood (1, 0.3%) and headache and insomnia (1, 0.3%), and 6 placebo patients (1.9%) including headache and insomnia (1, 0.3%), irritability (2, 0.6%), headache (1, 0.3%), psychomotor hyperactivity (1, 0.3%), and tic (1, 0.3%).In the 2 placebo-controlled studies of adults, 25 methylphenidate hydrochloride extended-release tablets patients (6.0%) and 6 placebo patients (2.8%) discontinued due to an adverse reaction. Those events with an incidence of greater than 0.5% in the methylphenidate hydrochloride extended-release tablets patients included anxiety (1.7%), irritability (1.4%), blood pressure increased (1.0%), and nervousness (0.7%). In placebo patients, blood pressure increased and depressed mood had an incidence of greater than 0.5% (0.9%). In the 11 open-label studies of children, adolescents, and adults, 266 methylphenidate hydrochloride extended-release tablets patients (7.0%) discontinued due to an adverse reaction. Those events with an incidence of greater than 0.5% included insomnia (1.2%), irritability (0.8%), anxiety (0.7%), decreased appetite (0.7%), and tic (0.6%). In a long-term uncontrolled study (n=432 children), the cumulative incidence of new onset of tics was 9% after 27 months of treatment with methylphenidate hydrochloride extended-release tablets.In a second uncontrolled study (n=682 children) the cumulative incidence of new-onset tics was 1% (9/682 children). The treatment period was up to 9 months with mean treatment duration of 7.2 months. In the laboratory classroom clinical trials in children (Studies 1 and 2), both methylphenidate hydrochloride extended-release once daily and methylphenidate three times daily increased resting pulse by an average of 2 to 6 bpm and produced average increases of systolic and diastolic blood pressure of roughly 1 to 4 mm Hg during the day, relative to placebo. In the placebo-controlled adolescent trial (Study 4), mean increases from baseline in resting pulse rate were observed with methylphenidate hydrochloride extended-release and placebo at the end of the double-blind phase (5 and 3 beats/minute, respectively). Mean increases from baseline in blood pressure at the end of the double-blind phase for methylphenidate hydrochloride extended-release and placebo-treated patients were 0.7 and 0.7 mm Hg (systolic) and 2.6 and 1.4 mm Hg (diastolic), respectively. In one placebo-controlled study in adults (Study 6), dose-dependent mean increases of 3.9 to 9.8 bpm from baseline in standing pulse rate were observed with methylphenidate hydrochloride extended-release at the end of the double-blind treatment vs. an increase of 2.7 beats/minute with placebo. Mean changes from baseline in standing blood pressure at the end of double-blind treatment ranged from 0.1 to 2.2 mm Hg (systolic) and -0.7 to 2.2 mm Hg (diastolic) for methylphenidate hydrochloride extended-release and was 1.1 mm Hg (systolic) and -1.8 mm Hg (diastolic) for placebo. In a second placebo-controlled study in adults (Study 5), mean changes from baseline in resting pulse rate were observed for methylphenidate hydrochloride extended-release and placebo at the end of the double-blind treatment (3.6 and –1.6 beats/minute, respectively). Mean changes from baseline in blood pressure at the end of the double–blind treatment for methylphenidate hydrochloride extended-release and placebo-treated patients were –1.2 and –0.5 mm Hg (systolic) and 1.1 and 0.4 mm Hg (diastolic), respectively [see Warnings and Precautions (5.1)]. Methylphenidate hydrochloride extended-release should not be used in patients being treated (currently or within the preceding 2 weeks) with MAO inhibitors [see Contraindications (4.5)]. Because of possible increases in blood pressure, methylphenidate hydrochloride extended-release should be used cautiously with vasopressor agents [see Warnings and Precautions (5.1)]. Human pharmacologic studies have shown that methylphenidate may inhibit the metabolism of coumarin anticoagulants, anticonvulsants (e g , phenobarbital, phenytoin, primidone), and some antidepressants (tricyclics and selective serotonin reuptake inhibitors). Downward dose adjustment of these drugs may be required when given concomitantly with methylphenidate. It may be necessary to adjust the dosage and monitor plasma drug concentrations (or, in the case of coumarin, coagulation times), when initiating or discontinuing concomitant methylphenidate. The effect of methylphenidate hydrochloride extended-release on labor and delivery in humans is unknown. It is not known whether methylphenidate is excreted in human milk. Because many drugs are excreted in human milk, caution should be exercised if methylphenidate hydrochloride extended-release is administered to a nursing woman. In lactating female rats treated with a single oral dose of 5 mg/kg radiolabeled methylphenidate, radioactivity (representing methylphenidate and/or its metabolites) was observed in milk and levels were generally similar to those in plasma. Methylphenidate hydrochloride extended-release should not be used in children under six years, since safety and efficacy in this age group have not been established. Long-term effects of methylphenidate in children have not been well established. Methylphenidate hydrochloride extended-release tablets have not been studied in patients greater than 65 years of age. As noted in the Box Warning, methylphenidate hydrochloride extended-release tablets should be given cautiously to patients with a history of drug dependence or alcoholism. Chronic abusive use can lead to marked tolerance and psychological dependence with varying degrees of abnormal behavior. Frank psychotic episodes can occur, especially with parenteral abuse.In two placebo-controlled human abuse potential studies, single oral doses of methylphenidate hydrochloride extended-release tablets were compared to single oral doses of immediate-release methylphenidate (IR MPH) and placebo in subjects with a history of recreational stimulant use to assess relative abuse potential. For the purpose of this assessment, the response for each of the subjective measures was defined as the maximum effect within the first 8 hours after dose administration.In one study (n=40), both methylphenidate hydrochloride extended-release tablets (108 mg) and 60 mg IR MPH compared to placebo produced statistically significantly greater responses on the five subjective measures suggestive of abuse potential. In comparisons between the two active treatments, however, methylphenidate hydrochloride extended-release tablets (108 mg) produced variable responses on positive subjective measures that were either statistically indistinguishable from (Abuse Potential, Drug Liking, Amphetamine, and Morphine Benzedrine Group [Euphoria]) or statistically less than (Stimulation – Euphoria) responses produced by 60 mg IR MPH.In another study (n=49), both doses of methylphenidate hydrochloride extended-release tablets (54 mg and 108 mg) and both doses of IR MPH (50 mg and 90 mg) produced statistically significantly greater responses compared to placebo on the two primary scales used in the study (Drug Liking, Euphoria). When doses of methylphenidate hydrochloride extended-release tablets (54 mg and 108 mg) were compared to IR MPH (50 mg and 90 mg), respectively, methylphenidate hydrochloride extended-release tablets produced statistically significantly lower subjective responses on these two scales than IR MPH. Methylphenidate hydrochloride extended-release tablets (108 mg) produced responses that were statistically indistinguishable from the responses on these two scales produced by IR MPH (50 mg). Differences in subjective responses to the respective doses should be considered in the context that only 22% of the total amount of methylphenidate in methylphenidate hydrochloride extended-release tablets is available for immediate release from the drug overcoat [see System Components and Performance (11.1)].Although these findings reveal a relatively lower response to methylphenidate hydrochloride extended-release tablets on subjective measures suggestive of abuse potential compared to IR MPH at roughly equivalent total MPH doses, the relevance of these findings to the abuse potential of methylphenidate hydrochloride extended-release tablets in the community is unknown. Signs and symptoms of methylphenidate hydrochloride overdosage, resulting principally from overstimulation of the CNS and from excessive sympathomimetic effects, may include the following: vomiting, agitation, muscle twitching, convulsion, grand mal convulsion, confusional state, hallucinations (auditory and/or visual), hyperhidrosis, headache, pyrexia, tachycardia, palpitations, heart rate increased, sinus arrhythmia, hypertension, rhabdomyolysis, mydriasis, and dry mouth. Efficacy of peritoneal dialysis or extracorporeal hemodialysis for methylphenidate hydrochloride overdosage has not been established. The prolonged release of methylphenidate from methylphenidate hydrochloride extended-release tablets should be considered when treating patients with overdose. Methylphenidate hydrochloride extended-release tablets USP are a central nervous system (CNS) stimulant. Methylphenidate hydrochloride extended-release tablets USP are available in four tablet strengths. Each extended-release tablet for once-a-day oral administration contains 18 mg, 27 mg, 36 mg, or 54 mg of methylphenidate hydrochloride, USP and is designed to have a 12-hour duration of effect. Chemically, methylphenidate hydrochloride, USP is d,l (racemic) methyl α-phenyl-2-piperidineacetate hydrochloride. Its molecular formula is C14H19NO2•HCl. Its structural formula is: Methylphenidate hydrochloride, USP is a white, odorless crystalline powder. Its solutions are acid to litmus. It is freely soluble in water and in methanol, soluble in alcohol, and slightly soluble in chloroform and in acetone. Its molecular weight is 269.77. Methylphenidate hydrochloride extended-release tablets USP also contain the following inert ingredients: colloidal silicon dioxide, fumaric acid, hypromellose 2208, hypromellose 2910, lactose monohydrate, magnesium stearate, methacrylic acid copolymer Type A, methacrylic acid copolymer Type B, talc, titanium dioxide, and triethyl citrate. The 18 mg strength also contains iron oxide red, iron oxide yellow, polyethylene glycol 3350, and polyvinyl alcohol. The 27 mg strength also contains FD&C Blue #2/Indigo Carmine Aluminum Lake, iron oxide black, iron oxide yellow, polyethylene glycol 3350, and polyvinyl alcohol. The 36 mg strength also contains triacetin. The 54 mg strength also contains iron oxide red, polyethylene glycol 3350, and polyvinyl alcohol. The imprinting ink contains ammonium hydroxide, iron oxide black, propylene glycol, and shellac.USP drug release testing pending. Methylphenidate hydrochloride extended-release tablets deliver methylphenidate hydrochloride at a controlled rate. The system is comprised of a hydrogel matrix extended-release core with a delayed-release coating surrounded by an immediate-release drug overcoat. In an aqueous environment, such as the gastrointestinal tract, the drug overcoat dissolves within one hour, providing an initial dose of methylphenidate. Both the delayed-release coating and the inner hydrogel matrix control drug release from the tablet core. The delayed-release coating slowly erodes upon exposure to the gastrointestinal tract to allow drug release from the hydrogel matrix core. Furthermore, the drug release rate from the system increases with time over a period of 6 to 7 hours due to the erosion of the delayed release coating resulting in increased exposure of the hydrogel matrix to fluids. The biologically inert components of the tablet may remain almost intact during gastrointestinal transit and may be eliminated in the stool in a form that may look like a tablet comprising of insoluble components. It is possible that methylphenidate hydrochloride extended-release tablets may be visible on abdominal x-rays under certain circumstances, especially when digital enhancing techniques are utilized. Methylphenidate hydrochloride is a central nervous system (CNS) stimulant. The mode of therapeutic action in Attention Deficit Hyperactivity Disorder (ADHD) is not known. Methylphenidate is thought to block the reuptake of norepinephrine and dopamine into the presynaptic neuron and increase the release of these monoamines into the extraneuronal space. Methylphenidate hydrochloride extended-release tablets was demonstrated to be effective in the treatment of Attention Deficit Hyperactivity Disorder (ADHD) in 4 randomized, double-blind, placebo-controlled studies in children and adolescents and 2 double-blind placebo-controlled studies in adults who met the Diagnostic and Statistical Manual 4th edition (DSM-IV) criteria for ADHD. In a randomized, double-blind, multi-center, placebo-controlled trial (Study 4) involving 177 patients, methylphenidate hydrochloride extended-release tablets was demonstrated to be effective in the treatment of ADHD in adolescents aged 13 to 18 years at doses up to 72 mg/day (1.4 mg/kg/day). Of 220 patients who entered an open 4-week titration phase, 177 were titrated to an individualized dose (maximum of 72 mg/day) based on meeting specific improvement criteria on the ADHD Rating Scale and the Global Assessment of Effectiveness with acceptable tolerability. Patients who met these criteria were then randomized to receive either their individualized dose of methylphenidate hydrochloride extended-release tablets (18 mg/day to 72 mg/day, n=87) or placebo (n=90) during a two-week double-blind phase. At the end of this phase, mean scores for the investigator rating on the ADHD Rating Scale demonstrated that methylphenidate hydrochloride extended-release tablets was statistically significantly superior to placebo. Two double-blind, placebo-controlled studies were conducted in 627 adults aged 18 to 65 years. 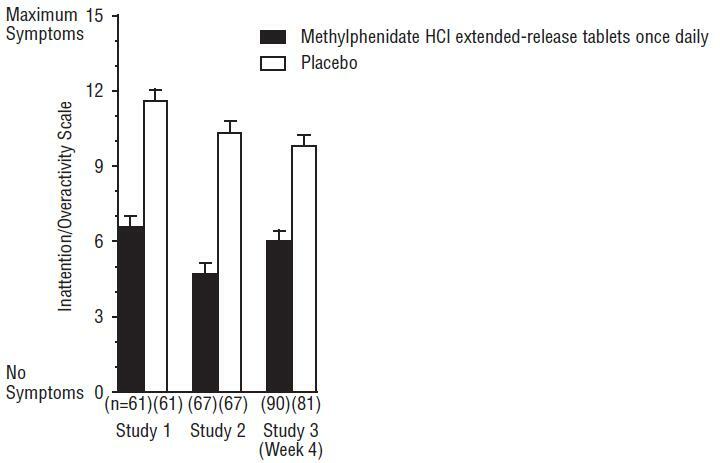 The controlled studies compared methylphenidate hydrochloride extended-release tablets administered once daily and placebo in a multicenter, parallel-group, 7-week dose-titration study (Study 5) (36 mg/day to 108 mg/day) and in a multicenter, parallel-group, 5-week, fixed-dose study (Study 6) (18, 36, and 72 mg/day). Study 5 demonstrated the effectiveness of methylphenidate hydrochloride extended-release tablets in the treatment of ADHD in adults aged 18 to 65 years at doses from 36 mg/day to 108 mg/day based on the change from baseline to final study visit on the Adult ADHD Investigator Rating Scale (AISRS). Of 226 patients who entered the 7-week trial, 110 were randomized to methylphenidate hydrochloride extended-release tablets and 116 were randomized to placebo. Treatment was initiated at 36 mg/day and patients continued with incremental increases of 18 mg/day (36 mg/day to 108 mg/day) based on meeting specific improvement criteria with acceptable tolerability. At the final study visit, mean change scores (LS Mean, SEM) for the investigator rating on the AISRS demonstrated that methylphenidate hydrochloride extended-release tablets was statistically significantly superior to placebo. Study 6 was a multicenter, double-blind, randomized, placebo-controlled, parallel-group, dose-response study (5-week duration) with 3 fixed-dose groups (18, 36, and 72 mg). Patients were randomized to receive methylphenidate hydrochloride extended-release tablets administered at doses of 18 mg (n=101), 36 mg (n=102), 72 mg/day (n=102), or placebo (n=96). All three doses of methylphenidate hydrochloride extended-release were statistically significantly more effective than placebo in improving CAARS (Conners’ Adult ADHD Rating Scale) total scores at double-blind end point in adult subjects with ADHD. Methylphenidate hydrochloride extended-release tablets USP are available as follows:18 mg – Each yellow, film-coated, capsule shaped tablet imprinted with the Andrx logo and 725 on one side and plain on the other side contains 18 mg methylphenidate hydrochloride, USP. Tablets are supplied in bottles of 100 (NDC 62037-725-01).27 mg – Each gray, film-coated, capsule shaped tablet imprinted with the Andrx logo and 734 on one side and plain on the other side contains 27 mg methylphenidate hydrochloride, USP. Tablets are supplied in bottles of 100 (NDC 62037-734-01).36 mg – Each white, film-coated, capsule shaped tablet imprinted with the Andrx logo and 726 on one side and plain on the other side contains 36 mg methylphenidate hydrochloride, USP. Tablets are supplied in bottles of 100 (NDC 62037-726-01).54 mg – Each red brown, film-coated, capsule shaped tablet imprinted with the Andrx logo and 727 on one side and plain on the other side contains 54 mg methylphenidate hydrochloride, USP. Tablets are supplied in bottles of 100 (NDC 62037-727-01).